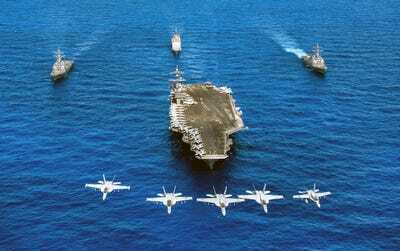 US Navy Adm. Harry Harris, the commander of the US military in the Pacific, told the Senate Armed Services Committee on Thursday that the US isn’t planning a one-off “bloody nose” strike on North Korea to humiliate and scare Kim Jong Un. Reports about President Donald Trump’s plans to strike North Korea have persisted for months, but Harris outright denied the “bloody nose” strategy. US Navy Adm. Harry Harris, the commander of the US military in the Pacific told the Senate Armed Services Committee on Thursday that the US isn’t planning a one-off “bloody nose” strike on North Korea, but rather it’s planning to go all out in war or not at all. Senior administration officials are reportedly exploring the “bloody nose” strategy, which entails a limited strike to humiliate and intimidate North Korea. When asked about this during the Senate hearing, Harris said no such plan existed. “We have no bloody nose strategy. I don’t know what that is,” Harris said in response to a question from Virginia Sen. Tim Kaine, USNI reported. “I am charged by the national command authority of developing a range of options through the spectrum of violence, and I’m ready to execute whatever the president and the national command authority directs me to do, but a bloody nose strategy is not being contemplated,” Harris continued. Experts uniformly reacted in horror at the news that President Donald Trump’s administration was reportedly planning a limited strike on North Korea, as they allege it would likely result in an all-out, possibly nuclear retaliation from Pyongyang. “If we do anything along the kinetic spectrum of conflict, we have to be ready to do the whole thing,” Harris said, pouring cold water on the idea of a limited strike that would only have rhetorical ramifications. Speculation over Trump’s willingness to strike North Korea peaked after he dismissed Victor Cha, a widely respected Korea expert, as US ambassador to South Korea after almost a year of consideration. Cha’s dismissal owed to his disagreement Trump’s plan to attack North Korea, multiple outlets reported at the time.